Posted by IaninSheffield in Musings, Resources. After watching a YouTube video, have you ever been enticed to click on one of the thumbnail links to other videos which appear after the video has finished? Or maybe followed one of the thumbnail links to other videos which are listed to the right of the main frame? I know I have. Which set me thinking about how YouTube can be bent to serve our learning needs in three ways, based on the three different approaches to learning I’ve previously reflected on. 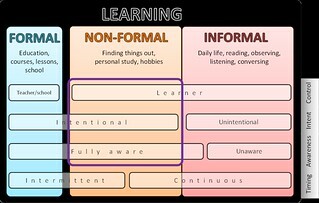 The boundaries between formal, non-formal and informal learning are fuzzy to say the least, since we must address several factors which influence the type of learning: independent versus institutionalised, structured v unstructured, teacher-directed v learner-controlled, certificated v open, scheduled v time-unbounded, intentional v unintentional, purposeful v serendipitous. So here is where we would see YouTube videos created (by a teacher/tutor/lecturer) to support students undertaking a course of study leading to a specific qualification. learning that is not provided by an education or training institution and typically does not lead to certification. It is, however, structured (in terms of learning objectives, learning time or learning support). 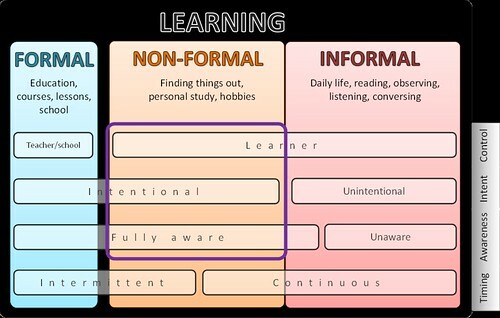 Non-formal learning is intentional from the learner’s perspective. This where we might see a learner taking an a non-credit art class for pleasure is directed to YouTube to learn more about a particular technique. Or perhaps an amateur astronomer attending a session at a local society on the techniques required to take a long-exposure photo, drops by YouTube to reinforce what she learned. These are the serendipitous moments where you set out with a specific goal, then were led down a completely different, perhaps even more stimulating path by the other videos YouTube offered you. You have no idea where these journeys might lead, or what riches of discovery they might offer, though we must also acknowledge that at times they may simply serve to distract or divert attention. So perhaps we have to accept that using YouTube in a school-context, where formal learning is the dominant form, YouTube is to some extent a double-edged sword. Whilst it can be used in a structured programme for intentional outcomes, it also comes with the rabbit hole of opportunity. Do we use a tool like Quietube or ViewPure which filters out many of the distractions or choose to celebrate the potential richness and additionality that informal learning might bring? I guess it depends on your viewpoint … and your students? Should you wish to explore further, Colley, Hodkinson and Malcolm3 discussed the field of formal, informal and non-formal learning in much greater depth, providing an excellent summary and overview; well worth a read. 1Eraut, M.R., 2000. Non-formal Learning and Tacit Knowledge in Professional Work. British Journal of Educational Psychology, 70(1), pp.113–136. Available at: http://www.ingentaconnect.com/content/bpsoc/bjep/2000/00000070/00000001/art00008 [Accessed May 18, 2013]. 2European Commission, 2001. Making a European Area of Lifelong Learning a Reality, Available at: http://eur-lex.europa.eu/LexUriServ/LexUriServ.do?uri=CELEX:52001DC0678:EN:NOT [Accessed May 18, 2013]. 3Colley, H., Hodkinson, P. & Malcolm, J., 2002. Non-formal learning: mapping the conceptual terrain, a consultation report, Available at: http://www.infed.org/archives/e-texts/colley_informal_learning.htm [Accessed May 19, 2013]. Posted by IaninSheffield in Musings, research. It doesn’t usually take me this long to get down to writing a post, but reflecting on the Rhizomatic Learning (RL) session with Dave Cormier has had me stumped … as indeed it did Dave. It’s not that it’s a particularly difficult idea, making as it does a metaphorical link with the way certain plants propagate as part of their growth process. 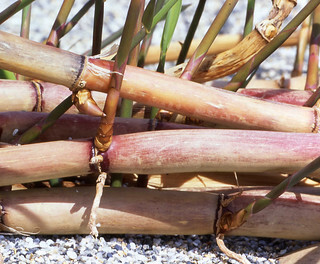 The main aspects include how easily and rapidly rhizomes spread, how haphazard growth can be via multiple paths (responding as they do to local environment) and the degree of resilience they exhibit (when rhizomes are severed, the parent plant continues to grow and the severed sections can form new plants). These factors are also found in certain learning situations, MOOCs in particular, but community-centred situations in general, which means RL can provide a model for describing learning under these circumstances. I can also see how learning rhizomatically helps deal with complex situations and help prepare learners for uncertain futures. Having telegraphed its arrival I’m going to jump in with the ‘BUT’ (and this is I guess why it’s taken me so long to write this post), there are aspects of RL with which I feel less comfortable. These fall into three camps: the first being how far the rhizome metaphor holds up in describing learning ecosystems, the second in how applicable it is to my continued experience in pre-higher education and the third is that RL might just be a bit of a cop out. Primary and secondary education (K-12) is dominated by formal learning and whilst a little non-formal might sneak in the back door, there is neither room for, nor acceptance of informal learning. Organisational structures, timetables, schedules and calendars, externally mandated curricula, school buildings, cultural inertia, educational dogma all serve to exclude informal learning. I’d argue its an environment entirely hostile to rhizomatic learning. Or to flip it around, the needs of the learners might not be best served by applying the principles of RL; they are after all dealing with neither complex nor chaotic circumstances, their curriculum is not ‘the community’ and though we might wish to ‘make them responsible for their own learning,’ whilst teachers and schools exist to take the fall, that’s going to be an incredibly hard sell to society. In all fairness, Dave C is not claiming that RL applies in all circumstances and maybe I simply have to accept that unlike behaviourism , cognitivism or constructivism, I’ll struggle to find a place for RL in school. Yet perhaps this is the source of the discomfort and disconnect I feel; the tension that I know exists where the immediate future of our learners is pre-ordained and clearly laid out, yet the future beyond their school is far from certain and their learning needs might be better served by a more rhizomatic approach. Having an ‘open syllabus’ where the ‘curriculum is the community’ and where learners determine their learning paths and success criteria, are all highly laudable aims, but I wonder to what extent they shift the responsibility away from the ‘course’ leader, thereby making their job a whole lot easier. No syllabus, no learning outcomes, no testing. It sure makes it a whole lot harder to be called to account by your line manager/employer if the learning experiences of your learners are less tangible. Or maybe it’s actiually the opposite and proponents of RL have a much tougher job justifying their existence when the evidence of their learners’ progress doesn’t conform to conventional structures (strictures?)? 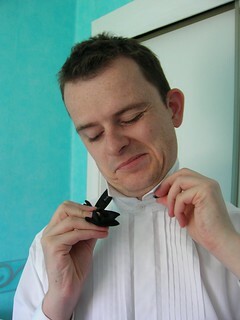 Perhaps then I’m looking in the wrong place for instances and applications of RL? I simply need to content myself with the fact that my own learning is often rhizomatic. It’s often chaotic, dealing as it does with complex issues in preparation for unclear futures. I determine my learning pathways, explore a plethora of different avenues and decide for myself when journeys are complete. My curriculum is indeed my community and maybe that’s enough … for now.